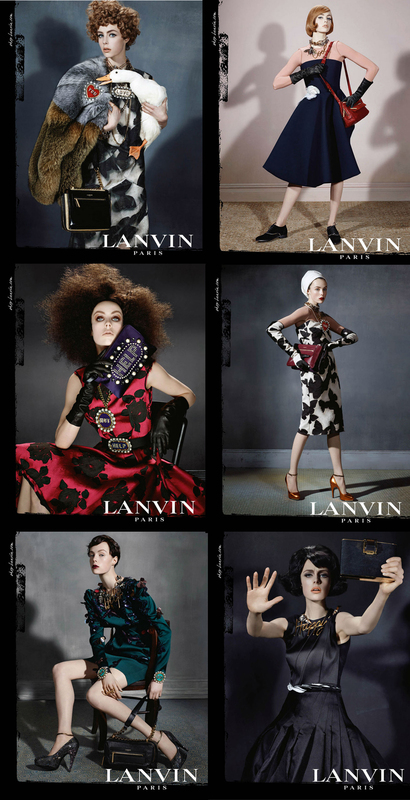 Ad Madness: Lanvin’s 60s-Inspired Fall 2013 Campaign! Along with the new fall previews hitting the pages of the best fashion magazines, you can expect lots to look at when it comes to ads for the biggest brands with the most stylish collections. I’m certainly paying attention to texture, pattern, shine, & accessories, especially when there’s plenty of 60s-inspired silhouettes to Lanvin‘s Fall 2013 campaign. Also, I love the nod to Hitchcock heroines like Grace Kelly & Janet Leigh, as well as plenty of Mad Men-chic looks. This is a more memorable ad with an elegant Aflac-esque duck held by the models, as quirkily demonstrated by director Alber Elbaz with shots taken by Steven Meisel of House + Holme. To shop Lanvin the luxury brand, check out retailers like Net-A-Porter, Nordstrom, Barneys, The Outnet, YOOX, Harrods, & Neiman Marcus! Do you like this ad campaign? What fall trends are you following? For more posts from Ad Madness, click on Rooney Mara’s short film for Calvin Klein’s Downtown, Adriana Lima & Georgia May Jagger dancing for Miu Miu, Diane Kruger as the new face of Chanel skincare, & Nicole Kidman for Jimmy Choo! Happy Styling! This entry was posted in Ad Madness, Style Darling Daily and tagged Ad Madness, ALber Elbaz, Fall 2013, Lanvin, Steven Meisel. Bookmark the permalink. ← Watch This Style: Finally! Rooney Mara’s Short Film For Calvin Klein’s Downtown!